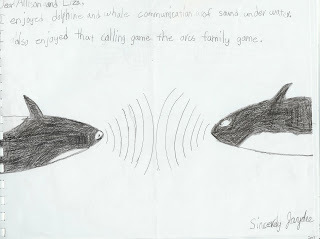 Once upon a time, a long time ago, in 1982 or 1983, we thought it would be interesting to have a hydrophone placed in the water off the dock, so that we could listen to orcas or other marine mammals. We mentioned the idea to two anonymous friends of PTMSC who had extensive experience with the US Navy. It didn’t take long for them to magically locate a “spare” hydrophone. All they asked was that we not talk about it publicly and that we meet them in some shopping center somewhere around Poulsbo or Bremerton. When Henry and Libby arrived at the rendezvous spot, they were handed an ordinary brown cardboard box rather quickly and encouraged to drive home immediately. In the box was the hydrophone and pre-amplifier needed to make the sounds audible inside the Center. During the next few weeks, extensive communications occurred between our benefactors and us, along with Washington State Parks. 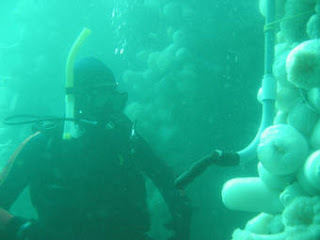 One of our faithful volunteers had good connections in the boating community and she was able to arrange for a vessel and crew and a team of divers to install it, fixed to a concrete slab straight off the dock, under 40 feet of water--all at no charge. For weeks and months after that, we listened and listened but never heard any sounds of life. But we did hear lots of boat noises. Curious to see what we were hearing, we "restored" one of the ground floor windows so we could see out. With time the sounds of boats grew faint and finally disappeared. We realized that the normal flow of sand offshore had completely buried the hydrophone and its concrete platform. And there it sits still - somewhere – 30 years later. Happily, however, we now have a working hydrophone in the Marine Exhibit that‘s used to listen to orca sounds and picks up vessel traffic traveling in the Strait.